By John F. McKenna (McJack): British and Commonwealth heavyweight champion Tyson Fury (16-0, 11 KO’s) who has been trading barbs in the press lately with “regular” World Boxing Association (WBA) heavyweight champion Alexander Povetkin (22-0, 15 KO’s) now says he wants to fight Povetkin. Povetkin became the “regular” WBA heavyweight champion when he defeated Rusian Chagaev in August. Vladimir Klitschko, who won the WBA heavyweight title belt when he scored a unanimous decision win over David Haye in July, was elevated to “Super” WBA heavyweight champion by the Word Boxing Association ruling body. His WBA title was then declared vacant, thus allowing for the title fight between Povetkin and Chagaev to determine who the “regular” heavyweight champion would be. The scenario is confusing at best. Povetkin’s promoter Khalle Sauerland initiated the back and forth charges and counter charges, when he accused Fury of ducking Povetkin. The German based promoter went on to say that the reason he believes Tyson is ducking Alexander is that his camp never responded to their initial inquiry regarding a possible fight with Povetkin. According to Sauerland he then went ahead and arranged a fight with 42 year old Cedric Boswell (31-1, 24 KO’s) in Helinski, Finland on December 3. Fury shot back by saying that when his promoter Mike Hennessey was contacted he advised Sauerland that he was very close to finalizing a deal to fight Canadian heavyweight champion Neven Pajkic (16-0, 5 KO’s) in November and to get back to him as soon as possible with a sensible deal. 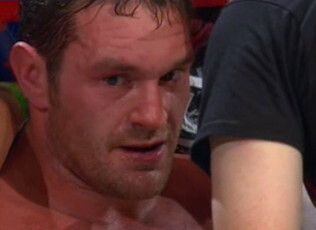 The Fury camp never heard anymore until Sauerland went public to say Fury was ducking Povetkin. Fury believes that the reason Povetkin’s people never got back to his promoter is because they knew Fury would be victorious in such a matchup and they wanted to make it appear to the media that Fury did not want the match. According to Fury the Povetkin camp was caught off guard and surprised that promoter Hennessey did not flat out turn down the offer to fight Povetkin. First Fury needs to take care of Neven Pajkic, who he will face next Saturday night in Manchester, England. Fury openly admits he despises Pajkic who he claims has insulted family members. For that reason Tyson wants to keep Neven around for a few rounds so he can punish him rather than go for a quick KO. After that he will turn his full attention to Alexander Povetkin. Tyson Fury believes that fighting Alexander Povetkin and taking his WBA heavyweight belt will give him a springboard from which he can eventually take on one of the Klitschko’s. « Angulo: Where does he go after the Kirkland beating?